How do Sith bake a wedding cake? Force lighting of course! The image above was taken at a friend's wedding I attended back in August. He claims to have hated/not liked Star Wars until he met me in college, but I think he's just trying to find someone to blame. He had a Star Wars themed cake that you can see in the image above, and he even convinced his bride(now wife) to use Star Wars music in part of the wedding. 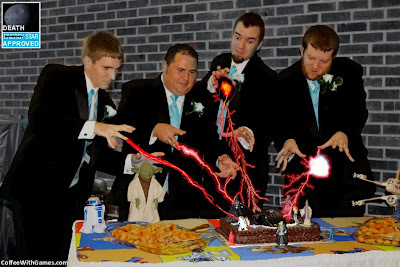 Is the Force lightning in the photo real? It doesn't really matter, because it is Death Star approved! Star Wars: The Force Unleashed II was released last year on October 26th with a MSRP of $49.99. The game was developed by Red Fly Studio and published by LucasArts. It received a "Teen" rating from the ESRB with "Mild Blood, Violence" listed as content for parents/gamers to be aware of. 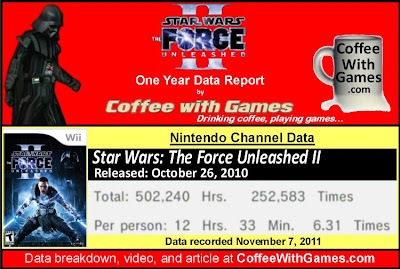 How many hours have Wii owners reported unleashing the Force, in Star Wars: The Force Unleashed II over the last year? Let's take a look! 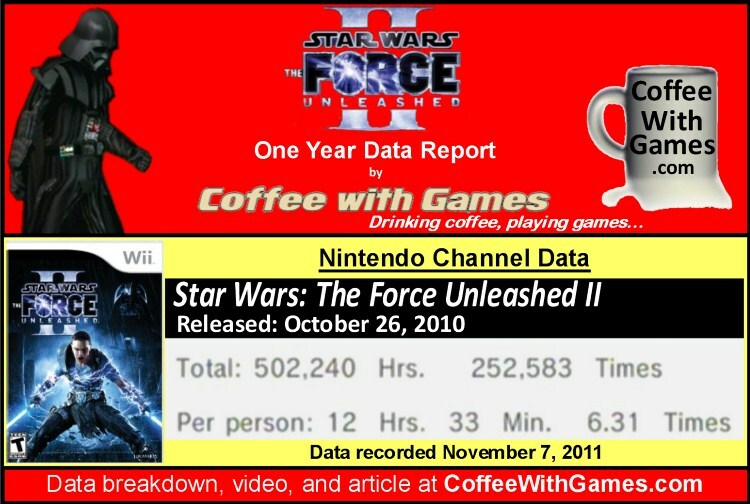 Star Wars: The Force Unleashed II now has 40,029 Wii owners that have reported game-play data through the Wii's Nintendo Channel, with 377 days possibly reported. The game's average play-time per day/session reported is now 1 Hour 59 Minutes. The Force Unleashed II has a "professional" review score average of 69.17%, based on 6 reviews on GameRankings.com. The game has a 3.5 out of 5 Stars rating on Amazon.com, based on 48 customer reviews. While I have not played Star Wars: The Force Unleashed II, it is on my list of games that I would like to play when I finish my video game backlog. 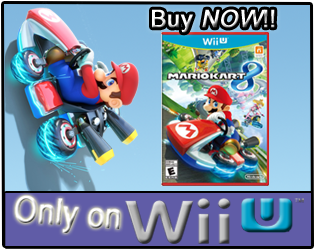 As I mentioned in the "Coffee Beans" section, the Wii version released with a MSRP of $49.99, but it can be found for under $20 on all the systems, as its MSRP is now just $19.99. Seeing the Wii version has more than 12 hours of game-play averaged "Per person", makes me think The Force Unleashed II is easily worth the lower price, especially considering the Wii version has a local multi-player mode. Have any of you played through Star Wars: The Force Unleashed II this year on any of the consoles? If so, which version did you play, and did you enjoy your time with the game? 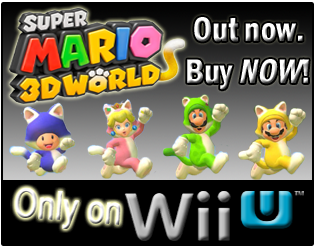 Based on the version you have played of the game, would you say it's more of a buy, or a rental? Yea, I do know the Wii version had a few changes to game-play because the developer actually changed, and so I'm interested to see how well those worked out.